As well as being some of the most storied names in world football, all were graduates of the Ajax academy — an institution long-famed for its prolific player output and pursuit of technical perfection. Nineteen-year-old Kluivert moved to Roma for 17.25 million euros ($19.54million) in 2018 while De Jong, 21, will join Barcelona later this year for $85 million. A host of Europe’s top clubs are also likely to battle it out for De Ligt, also 19, in the summer. While players have always moved on from Ajax, Blind acknowledges that the club’s most prized assets seem to leave far earlier than in generations gone by. There is “the risk that they go in two, three or four years” after being brought through from the academy, says Blind, whose son Daley was a product of the club’s academy. “That’s very difficult because all the time you have to rebuild the team,” he adds. Cruyff, the poster boy for Dutch soccer and its philosophy of “Total Football,” left for Barcelona in 1973, aged 27. But he did so having won 17 trophies in eight years as a first team player at Ajax. Few of Ajax’s top talents hang around that long now. And for Ajax CEO and former goalkeeper, Edwin van der Sar, the changing reality has forced the club to adapt. Other clubs of similar stature and pedigree across Europe — such as Benfica, Porto, Celtic and Anderlecht — have adopted similar models. What they lack in commercial or broadcasting riches they look to close the gap in player sales. “We don’t have the legends, we create them” says Van der Sar, who admits he expects to lose at least two to three players every year. But Ajax has had to be more creative in how it operates. The ultimate aim is find advantages the club can exploit to compete with richer rivals — something it has managed to do in recent years. Ajax qualified for the last-16 of the Champions League for the first time in 13-years this season. In 2017, meanwhile, it reached the final of the Europa League, Europe’s secondary club competition, where it lost to Manchester United. “I want to bring Ajax back on the world podium and deliver players for ourselves — to win trophies but also to (provide) the next step for (the players),” Van der Sar says. “Hopefully, as many Ajax players or ex-Ajax players are going to win the Champions League,” he adds. “I’d rather have it with our club. But then if not with a respective big club in other countries,” he adds. “Many of the trainers come from Amsterdam,” Endt says, where there is an attitude to “be courageous”and go “out and play with conviction.” Others are former players who know what it takes to make it at the club, he adds. 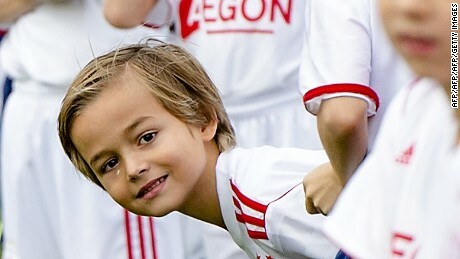 Ajax christened its “School for the Future” in 2015 that allows young players to receive a customized education at a facility on the club’s training ground. It aims to ensure that those who don’t make it at least have qualifications to fall back on. But it also seeks to produce intelligent students that can understand the way Ajax plays. Endt believes what set Cruyff apart from many of his contemporaries as a player was his “out of the box thinking” that gave him the edge on physically stronger or quicker opponents. Then again, he’ adds, you have to find a way “to outwit” those who may be bigger and stronger.